The Mission of Motherhood: Touching Your Child’s Heart for Eternity – Happy. Homeschooling. Housewife. I was told about this book by a fellow ‘sister’ friend at our woman’s retreat. During her testimony she talked about how much this book helped her step into and embrace God’s design of motherhood. Since it helped her so much (and then later I discovered several women from my church had already read the book) I knew I had to read it too. As soon as I got home I ordered it. Although it took me two days to read, it stills sits on my nightstand as I always find myself going back to get more wisdom and encouragement. 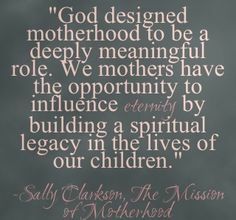 Mission of Motherhood really puts on the page, in simple plain text, how motherhood is a ministry with a purpose–to raise our little ones hearts towards the Father. I am thankful for Sally Clarkson, for her courage to write this book about her own journey as a mother (the good and the not so good). I think we need more books like this. It quenched places in me I didn’t even realize was begging for water. It also has made me much more excited to engage my girl’s hearts, even when I sometimes don’t have the energy to. So thankful for that. If you are looking for some encouragement and advice, please order this book. It will nourish your soul well! Next My Top 6 Kitchen Gadgets I Can’t Live Without!